Waste. Every business produces it, yet how effectively is it being managed in your company right now? Chances are it’s crossed your mind, but as a small business owner, you may not be sure what your options are when it comes to commercial waste collection. So we’ve compiled a handy guide to help you assess this key area of your business, including a breakdown of the cost of waste disposal. What factors affect waste prices? Read the whole article for a complete overview of commercial waste disposal prices, or skip to the section that’s most relevant to your business for a closer look at that topic. Alternatively, to compare quotes for commercial waste management straight away, simply complete the form at the top of the page. Waste prices vary, depending on several factors, including the type, size and amount of waste to be collected. In this section we provide a guide to approximate waste disposal prices. If the waste exceeds the standard charges outlined to you then you can expect to pay more. Here are some guidelines for prices for one-off van collection of commercial waste. Note that prices depend on the type of waste, as well as the limit given. This is usually either weight (e.g. up to 200kg) or price (e.g. £300) for the time and labour required to clear and dispose of the waste. Be sure to check if prices are inclusive or exclusive of Value Added Tax (VAT), as this can alter the price, depending on this is relevant for business or not. The figures above are based on excluding VAT. These charges are based upon the size of bin as well as for the bin hire and collection. Another factor that may affect local council bin collection hire prices is your business type, with charities and nurseries some examples of businesses that may be subject to different rates. Similarly, recycling is often collected for a different fee. It may also be possible to get your business waste collected in bags or sacks, which tend to be charged on the number used per week, as well as the collection frequency. It’s possible for business waste collection to be done by your local council, subject to a fee. Some benefits include that they know the local area, and as you may already be used to the local council collecting your household rubbish, they’re a more familiar option. However, if your business operates across different boroughs or multiple councils then you may have to arrange collections with each council separately. Also, your business may be subject to differing fees across the locations. What are the different types of commercial waste? Inert waste is rubbish such as rubble or debris. Landfill waste describes the waste that cannot be recycled or otherwise treated and so is stored in the ground. Green waste is rubbish from kitchens and gardens that is organic and can be used for compost. Recyclable waste also refers to waste that can be reused or remade, such as paper or glass. Scrap waste can be cardboard, metal or paper. Hazardous waste is waste that can be dangerous or hazardous, and so has to be disposed of with separate, specific process. Examples of hazardous waste include asbestos or solvents. Bulky items are objects such as mattresses, TVs or refrigerators, which take up a lot of space and may need to be disposed of separately. Builders’ waste is the term for the rubbish produced from building or construction work. Hazardous waste and other items (such as asbestos and tyres, for example) are often either not accepted by regular waste collection teams, or if they are, will incur a higher charge. It also depends on if the waste carrier has the necessary license to carry hazardous commercial waste. Also, mattresses and other bulky items (like refrigerators, air conditioning units,TVs and monitor screens) are likely to be collected at a higher price point. This is useful to note if you’re a landlord clearing your property, or if you run a hotel or bed and breakfast business, for example. If both household and commercial waste will be in the same collection, then custom rates may apply, as commercial waste applies only to the waste produced from the part of your home that you use for business. What are the different options for commercial waste collection? Whichever option you choose, ensure the waste collection service is licensed (or you are as a waste carrier), as otherwise you could be fined – remember that your rubbish is your responsibility, up until and including the disposal process. You may be able to see a company’s licence online, if provided. Using a waste management company isn’t your only option – it’s also possible to take your business’ waste to a waste transfer station. If you’re transporting waste that is only produced by your business then it’s generally free. If you’ll be transporting other waste too, then a £154 registration fee applies. Note that you’ll also need to register if you organise for someone else to dispose of your business’ waste. Also, take into account the amount of time and fuel it’ll require for you to get the waste to the waste transfer station. At a waste transfer station, waste is usually charged per tonne – a minimum charge or weight may apply. An approximate price for general mixed waste could be around £170 per tonne. Prices may vary depending on your business’ location and if you have an account or not with the waste disposal provider. The charge for businesses to use the sites where the waste will be disposed of. Landfill tax applies for waste that is sent to landfill. Read the Gov.uk guide to landfill taxes for more information. There are a number of factors that contribute to the cost of waste of disposal. Here we outline some of the key areas to consider when working out how much funds to allocate for this business expense. How much waste is to be collected? Firstly, consider how much waste your business produces and needs to be cleared. It makes sense that the more waste there is, the higher the price is likely to be. It’s wise to check if the waste prices include loading and sweeping (in addition to collection and disposing) the waste. How many people are in the waste disposal team? Generally, waste management services send two-person teams to collect rubbish. However, if it’s just one person this may take longer but be a cheaper option. Alternatively, more people may make for a quicker collection (but incur more labour charges). This should be clear, with prices quoted as inclusive or exclusive of VAT. This may or may not be relevant to your company, depending on your specific business situation. How frequently will the collection occur? If you require commercial waste to be collected on a regular basis, this may incur different rates compared to one-off collections. What’s the type of waste? Builders waste and hazardous waste are usually charged differently to standard commercial waste due to the way in which they must be carried and disposed. Where will the waste be collected from? Waste disposal prices can be affected by location, depending on the different post codes. This is something to consider, especially if you’re trying to organise waste collection for your business that has multiple premises or sites. If your business is in London or has a London postcode that waste is to be collected from, check if the congestion charge (and other similar transport fees) are included in the price, or if they are charged as extra. Also, prices will depend on if the waste is collected from your location or if you take it to a waste transfer station. Be sure that you have the relevant measures in place to allow you to transport waste safely and legally if you opt for the latter. How will the waste be disposed of? Remember that different fees apply not only based on location, but on how the waste will be disposed of. For example, landfill waste is taxed, and different rates apply for England, Wales and Scotland. Tip: Avoid these charges and help the planet by opting to recycle or reduce the waste instead. You could opt for a commercial waste management company that uses eco-friendly or green disposal methods. Which type of supplier is best for my business? 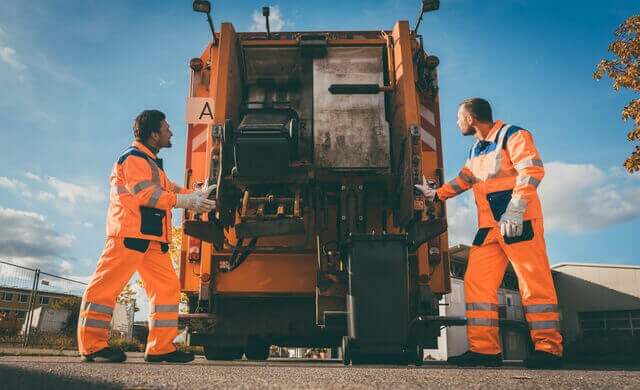 Opting to use a local, regional or national waste collection service each has its own pros and cons, including how much it’ll cost your business, so think about what type of supplier would be best suited to your business’ needs. When does the waste need to be collected by? The amount of notice time you provide, such as short notice with a need for immediate collection, or an ongoing regular collection, are both likely to be priced differently. How is the waste described? You need to provide descriptions of the waste your business produces – this is known as a Waste Transfer Note. If you provide inaccurate descriptions of waste (such as its size, type, or amount) this could result in additional fees upon collection. Remember that waste disposal costs include the collecting and managing of waste, as well as the process and any other related costs, if applicable. Commercial waste collection: What are the ways to pay? Payment is usually accepted by card or on an ongoing account; sometimes a business cheque may be accepted. Cash is generally not accepted as a payment method for waste collection services. While every business is different (and therefore it’s useful to compare quotes for commercial waste management based on your company specifically), the above points should help you create a budget. From reading this article, you’ve learned more about waste disposal prices, including the different types of waste collection and their relevant costs. We’ve also provided a guide to other aspects to consider, such as how your business’ location, the type of bins used and where the waste is disposed of can all contribute to the cost of waste disposal. So where do you go from here? The prices on this page are a general guide – for more specific information related to your business’ requirements, fill in the form at the top of the page to compare quotes for commercial waste management.